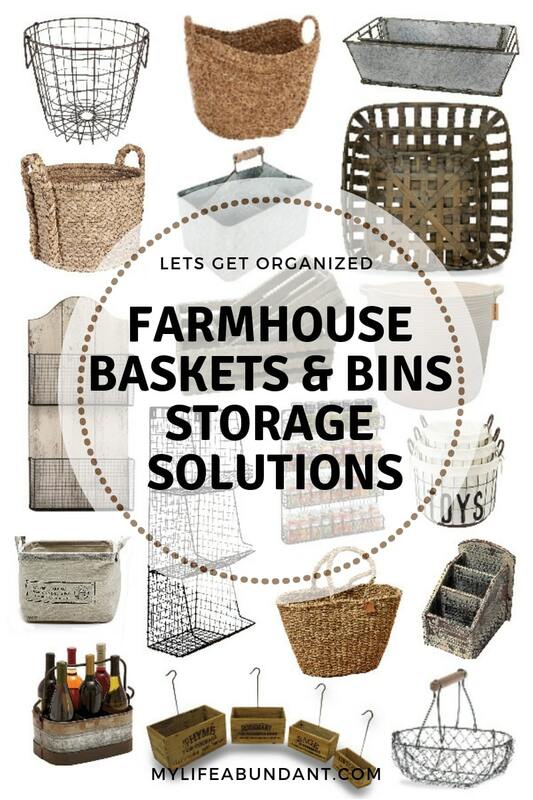 Beautiful, practical and easy to find farmhouse storage baskets and bins. If you love farmhouse decor as much as I do, you want all your storage items to look the same way. I’ve heard people say you can’t find farmhouse items on Amazon. Well, here are a few I have found that definitely puts the word “farmhouse” in storage. Perfect post for this time of year. Since I’ve been watching the Mari Kondo show on Netflix I need some of these in my life. I love all of these. I need to get more storage baskets, so I might have to get some of these. I am working on organizing the garage. I’m always looking for new storage solutions that are functional and beautiful. You’ve made my job harder because I’m in love with all of these baskets and bins. That is so cool! I want to decorate my house more farmhouse like! This is a great way to do it without spending too much! My husband and I recently purchased a small homestead and I am all about farmhouse decor. I love these! I love trying new storage ideas in my home and I’m always looking for new storage solutions. I have to check out these sites. I love the size of the large wicker basket. I am always looking for great looking storage bins. I love the farm house look – these are so right up my alley! These are all so pretty! I’m a big fan of the farmhouse look, and I love to use bins and baskets for storage. They look so good in a room. I love storing things in cute baskets all over my home. I think my favorite one right now is a huge basket of blankets in my living room! I love the farmhouse look and these are so cute, I could 100% see my buying and using any of them in my own home! I am decluttering and redecorating a lot of our house so I have been in the market for cute storage solutions. These are some cute bins and baskets! There’s a great variety of baskets! Mixing decor and storage is a good idea. I think my wife would really like this. I may have an obsession with this sort of thing. I tend to buy them more than I need to. These are great ideas for farmhouse decor. Love it! I love farmdecor design. All these items are awesome! My sister has the right place to use them! I should gift her some! I love all of these. I have two woven baskets that I use for winter blankets. It’s perfect to use for just about anything. This is gorgeous decor! I love farm house, rustic type decor. I have a lot of family farming in my family on both sides (mom and dad’s side) and I have always been fascinated with their farm house decor. I’ve just bought two new storage bins! Love grabbing new storage pieces!